The Cleridae are a family of elongate, hairy beetles, some if which are brightly coloured. Most clerids are predatory on other insects both as adults and larvae. 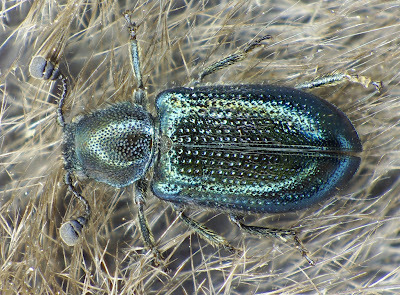 Members of the genus Necrobia, the ham beetles, are commonly associated with carrion or animal-derived food products and may be notable stored product pests. Characters (from Lawrence & Britton 1991): Elongate, parallel-sided, clothed with erect, or erect and decumbent, hairs, often either metallic in colour or patterned with red or yellow. Head usually more or less deflexed; eyes usually slightly to strongly emarginate; antennae short; labial palps often enlarged and securiform; pronotum usually without lateral carinae; prosternum well developed in front of coxae; tarsi with one or more segments lobed or with membranous appendages; first tarsal segment sometimes reduced and concealed within tibial apex. Larvae elongate, cylindrical to somewhat flattened, lightly sclerotised except for head, one or more tergal plates on thorax and T9 but cuticle often pigmented with yellow, pink, blue or brown. Head well sclerotised dorsally and ventrally; gula long and narrow; mandible with hyaline process at base; epicranial stem usually absent, median endocarina usually present.